This is a very interesting time for the automobile industry – it is interesting to think about just how much cars have changed when they were first developed. The exhibit Model T at 100 is at the Frick Musuem until May 3, 2009. has a 1914 Model T as part of their collection and they have borrowed some other Model T’s for the exhibit. When Henry Ford unveiled the Model T in 1908, few could have anticipated the incredible 19-year production run that awaited the vehicle. Simply put, the car was a revolution on wheels. More than 15 million Model Ts were sold worldwide, placing it among the top-selling automobile models of all time. A Revolution on Wheels: The Model T at 100 celebrates the T’s birthday with an exhibition of five examples of the Model T, representing a variety of body styles from 1909 to 1926. The Frick has borrowed four models to supplement the 1914 Model T Touring car already in our collection. 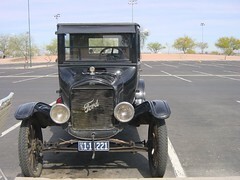 They include a 1909 Model T Touring Car, a 1917 Model T Runabout, a 1925 Model T ‘Depot Hack,’ and a 1926 Model T Coupe. All were built by the Ford Motor Company in Detroit, Michigan, with the customized body of the ‘Depot Hack’ manufactured by the Calumet Truck Body Corporation in Calumet. Michigan.